For some reason, I get inspired by carpet designs a lot. There are some fabulous rug/carpet patterns (especially in Vegas! 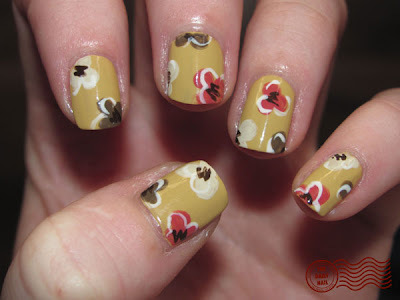 ), and carpet patterns work really well as nail art. (at least I think so). Today's nail art is inspired by a rug pattern that I saw online! I used American Apparel Trenchcoat as a base, with American Apparel California Trooper, American Apparel Cocoa, and Orly Pink Chocolate for the flowers. For the center of the flowers, I used American Apparel Raccoon, then outlined the flowers very loosely with American Apparel Cotton. Topped it all off with 2 coats of Seche Vite top coat.